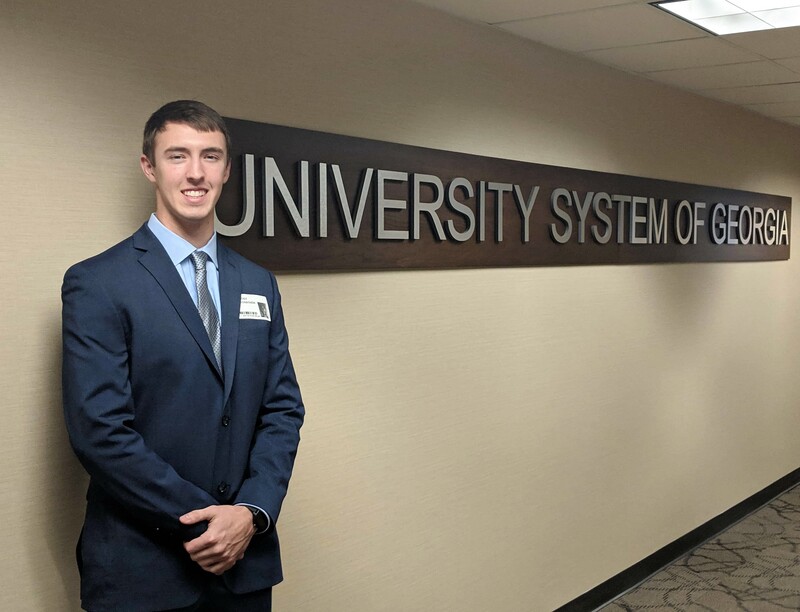 College of Coastal Georgia senior Jonathon Edgy was awarded the 2019 Academic Recognition Day Award by the Board of Regents of the University System of Georgia on February 12. The Waynesville, Georgia-native was recognized along with 26 students, each representing a USG institution. To be selected for Academic Recognition Day a student must have outstanding scholastic achievement at their institution, have a 4.0 grade-point average, be an undergraduate student, and a Georgia resident. Edgy was nominated for the honor by two professors at the College, Dr. Colleen Knight, associate professor of chemistry and chair of the Department of Natural Sciences, and James Carpenter, assistant professor of biology. Although Edgy has high academic achievements, what made him stand out from his peers was his ability to motivate others and exceed people's expectations. Edgy is set to graduate in May with a bachelor's of science in biological sciences with a concentration in biomedical science. His current plans are to pursue a career as a family medicine physician and is in the process of applying to medical school. He initially wanted to be an engineer but one fateful anatomy class in high school sparked a new interest, shifting his career trajectory towards medicine. His interest was especially piqued after shadowing a family physician. "It was pretty interesting because you never know what you're going to see when people come in," Edgy said. "It wasn't until I graduated from high school that I knew I wanted to be a physician—which kind of surprised me." His career aspirations may have come as a surprise, but what didn't surprise his professors was Edgy being selected for this year's Academic Recognition Day. In Knight's nomination letter, she describes Edgy as being attentive, active in the classroom, and "an absolute delight to teach." "He has proven to have strong work ethic and initiative. He sets his priorities wisely and efficiently manages his time," Knight wrote. "Jonathon is also well-liked by his peers and is often consulted for his opinion during class discussion. He has the ability to establish rapport quickly, and makes anyone feel comfortable. I believe he represents the best of what College of Coastal Georgia has to offer." Carpenter shared similar sentiments and considers Edgy to be one of the best students he's taught during his decade at the College. For Carpenter, what stood out the most was not only Edgy's strong academic record, but who he is as a person. "What distinguishes Jonathon most in my mind is a maturity, seriousness, and dedication to his career goals, while at the same time leavening those qualities with humor and humility," Carpenter wrote. "In terms of personal character, Jonathon is a genuine and kind individual, exceedingly polite and responsible. He is soft-spoken, but popular and respected by his peers. This is not only because of his skills but also because he is willing to invest time and effort to work with and assist others. He is a uniquely gifted person with a rare combination of ability and compassion." Edgy was shocked to learn that he was nominated and selected for Academic Recognition Day. His parents, who accompanied him to the Board of Regents, were equally surprised. On the actual Academic Recognition Day, Edgy, his parents, and the other honorees enjoyed a luncheon with Board of Regents members. The students stood as their names were called, while everyone learned about their majors and future plans. Along with being a hardworking student, Edgy is a supplemental instructor for anatomy and physiology. Supplemental instruction is a proactive academic support program intended to facilitate student learning and promote good study habits. The instructors are students who have previously completed and earned a high grade in the class in which they are assigned to help. Instructors attend each class period with students, take notes, and complete assigned readings. They then hold review sessions for students in that class. "When I first started as an SI, I just thought I could get up and talk about the course," he said "but you need a plan and must explain the material in way that's easy for people to understand." Edgy gets a lot of practice teaching students since he also works as substitute teacher in the Brantley County School District. He substitutes from elementary to high school, with his favorite being elementary. Although there's a lot on Edgy's plate, he always makes studying a priority. When he first started at the College he realized that the rate of information is higher in college compared to high school. He had to adjust quickly. "Before I didn't have study groups, but I found that really helps. Going to the SI sessions and having people to bounce ideas off of helped consolidate information," he said. "I actually put more time in studying, learning how to study, and adopting new techniques on how to study smarter—not just harder." He advises other students to enjoy what they're learning to make studying easier. "You can't succeed in something you don't like," Edgy said. He also encourages taking the time to have fun. Edgy learned something really valuable from his experience at Coastal Georgia. "I learned that you can do anything you set your mind to," he said. With this mindset, Edgy is set up for a successful, long-lasting career. This was apparent to Carpenter when he wrote, "It is my belief that Jonathon is just beginning to realize his potential for achievement and intellectual growth. I am confident that he will succeed at a high level in his future career endeavors."